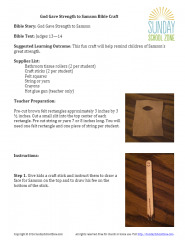 This fun craft will help teach children about the story of Samson and remind kids of Samson’s great strength. 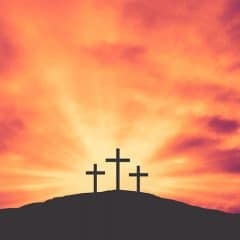 Samson was a man of many strengths and weaknesses, but at the end of his life when he trusted God, God used him. 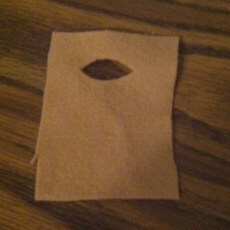 Pre-cut brown felt rectangles approximately 3 inches by 3 ½ inches. Cut a small slit into the top center of each rectangle. Pre cut string or yarn 7 or 8 inches long. You will need one felt rectangle and one piece of string per child. Step 1. 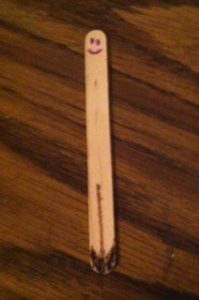 Give kids a craft stick and instruct them to draw a face for Samson on the top and to draw his fee on the bottom of the stick. Step 2. 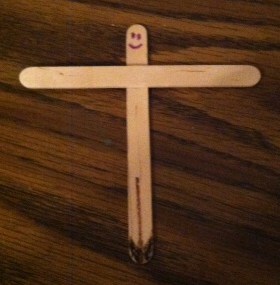 Carefully hot glue another craft stick across the first stick to create Samson’s arms. Step 3. Give students the piece of felt and instruct them to slip this robe over Samson’s head. Use the glue gun to secure the robe to Samson’s body. When glue is dry and cool, allow students to tie the robe in the middle with the string. Step 4. 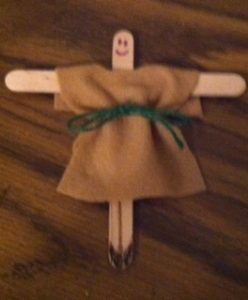 Using one dab of hot glue, secure Samson to a piece of construction paper or cardstock and instruct students to add Samson’s long hair with a crayon. 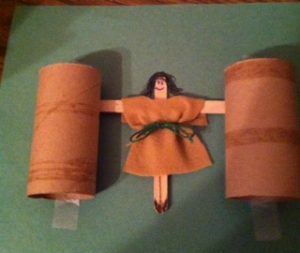 Allow students to glue or tape the two tissue paper rollers onto either side of Samson to become the two mighty pillars Samson destroyed.